Atlas builds upon and unites HashiCorp's open source tooling to automate and audit infrastructure changes across providers. Vagrant, Packer, Terraform, Consul, and Vault are connected to create and establish a workflow that enables organizations to not only manage infrastructure, but audit and collaborate on those changes in a central location. This post will focus on using Atlas to connect Packer and Terraform to create an automated pipeline for building and deploying artifacts and immutable infrastructure. Logstream is a simple Go application that is proxied via an ELB, which performs routing and SSL termination. It is designed to be stateless and horizontally scalable under increased load. First, Packer runs in Atlas to build the Logstream AMI. This artifact output is then stored in Atlas' artifact registry, namespaced, and versioned under hashicorp/logstream. Terraform then reads from the artifact registry and deploys new instances using this AMI. 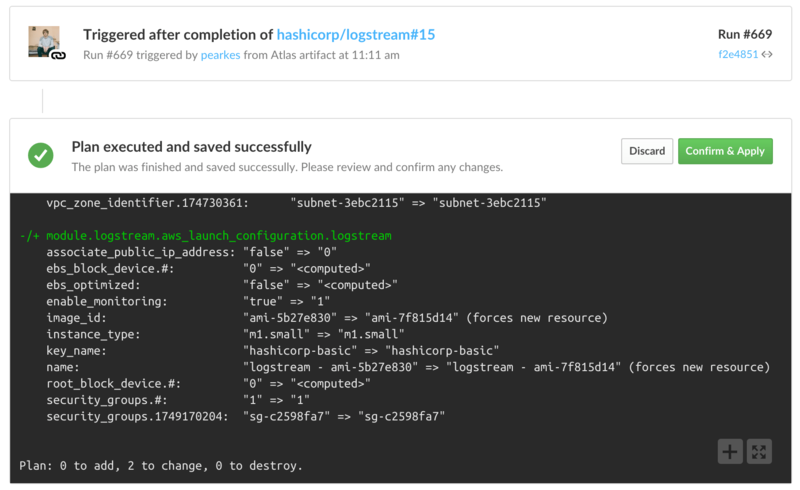 When the Logstream AMI is updated, the process starts again – continuous delivery for immutable infrastructure. Packer is used with Puppet to create the Logstream AMI. Packer automatically provisions an instance in AWS, runs the Puppet modules to configure the machine, snapshots the machine to create an image, stores that image, and then terminates the machine. All of this is done at build-time, which eliminates configuration drift, speeds up deploys, and reduces risk. For any runtime configuration, Logsteam (and all of our services) use Consul Template. This balance uses the strengths of the various tools – Puppet handles installing dependencies, laying down files, and preparing the operating system, while Consul Template renders the configuration for the Logstream service by watching for changes in the Consul key/value store. This allows operators to roll configuration changes out instantaneously for specific keys and services by updating values in the Consul web UI or via the API, but still focuses on up-front build-time configuration. After pushing the Packer template and associated provisioning files to Atlas, Atlas starts and provisions the instance and uploads the resulting artifact (an AMI ID) to the Atlas artifact registry, all without running Packer on an operator machine. Logs and history of this image creation process are preserved with visibility for the whole organization, as pictured in the screenshot below. Packer is a popular open source project made by HashiCorp that handles all image creation in Atlas – the same configuration format used when building in Atlas can be used locally, and is fully portable between environments. Terraform is a HashiCorp tool for automating infrastructure provisioning. Terraform is used to safely deploy the Logstream service defined in the Packer-built AMI above. It does this by using Terraform "Provider Resources" such as aws_instance or aws_launch_configuration, which have distinct knowledge of deployment and image rolling requirements. In the case of AWS, an AMI is used as the identifier for the created image – as long as the AWS account launching the image has access to the resulting AMI from the Packer build, it can be used during the deploy phase. The Atlas artifact registry is used to store and version the artifact – in this case an AMI identifier – in order to automate and describe the artifact dynamically. In the following example, the Terraform atlas_artifact resource is a pointer to the latest AMI ID created by the Logstream build. Without the Atlas artifact registry, this would require an AMI ID to be copied manually into Terraform configuration from the AWS console or Packer output. With the registry, Terraform configuration changes are not required after new AMIs are created. This is an example of referencing the Atlas artifact in Terraform configuration. With this configuration, Terraform will detect the new version of the Logstream artifact on refresh and generate a diff during the terraform plan. When terraform apply is run, Terraform will change the underlying instance or AutoScaling Group to use the new AMI. If you are running Packer builds and collaborating on Terraform in Atlas, a successful Packer build can automatically queue Terraform plans. This extends the above example using the registry to also trigger based on registry changes, further automating parts of the pipeline. Following a completed build of the Logstream image, the Atlas UI below shows the automatically triggered terraform plan. The plan is now waiting for a human operator to confirm and apply the change. This allows operators to follow the cause of the change and determine why the infrastructure needs to be modified. Instead of manually referencing the artifact, updating it after a build and triggering a new plan, the whole process is automated and visible to the entire organization. There are a number of places to start building out a pipeline similar to this. Because Packer and Terraform are agnostic to specific tools or technologies, you can begin implementing with existing configuration management, cloud providers or containers. We recommend following the guide for Creating AMI Artifacts with Atlas in the Atlas help, or reading about Atlas. In future posts, we will continue detailing aspects of this pipeline, including notifications to Slack, Email, and HipChat at each stage of builds and deployment. Note: There is currently a beta feature that further automates this pipeline. This feature removes the plan confirmation step and automatically deploys instances using the newly created images without the need for explicit operator confirmation. This is experimental, and detailed here.